Regular dental visits are key to preventing future oral disease and tooth loss. The relationship between you and your dentist affects the quality of your care, so when you move to a new area, or decide to change dentists, knowing how to find a dentist who meets your needs is important. Be prepared to invest some time in finding the right match. The American Dental Association (ADA) suggests using the Find-a-Dentist feature at MouthHealthy.org to locate affordable dentists in your area. You can also ask family, friends, neighbors, coworkers, doctors, and other healthcare professionals for recommendations, or contact your state dental society for help. 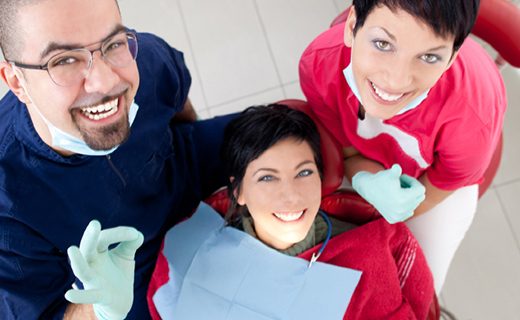 Dental care is personal matter, so it’s wise to visit several dentists before making your selection. By the end of the first visit, you should be able to answer the following questions and consider their implications. Are the office hours and appointment times convenient? Can you get to the office easily from home or work? Is the office and exam area clean and organized? Was your dental history and medical information recorded to a permanent file? Does the dentist practice and recommend preventative care? How does the dentist handle emergencies when the office isn’t open? Did you receive clear information about fees and payments before your treatment? Is the dentist a member of the ADA? A dentist with the title “DDS” is a Doctor of Dental Surgery, while one listed as a “DMD” is a Doctor of Dental Medicine. The two degrees are essentially the same. Both dentists have received identical education and training and are held to the same strict standards.